Lay back, kick your shoes off and chill out at this travellers paradise. 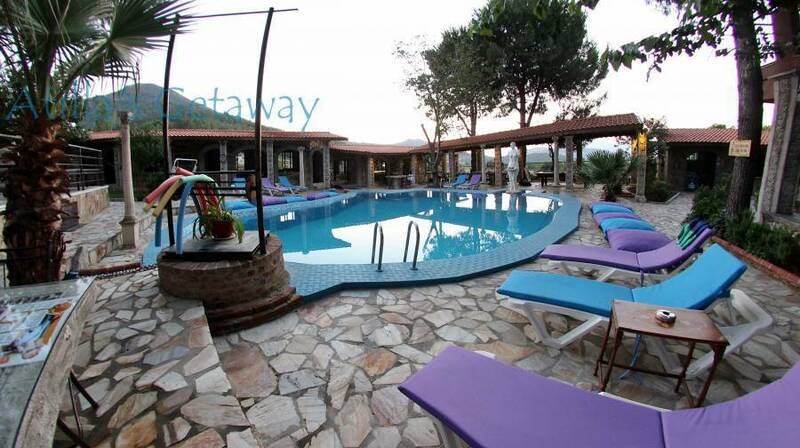 Nestled in the mountains of Ephesus, the 2nd largest ancient city in the world, Atilla's Getaway is home away from home. 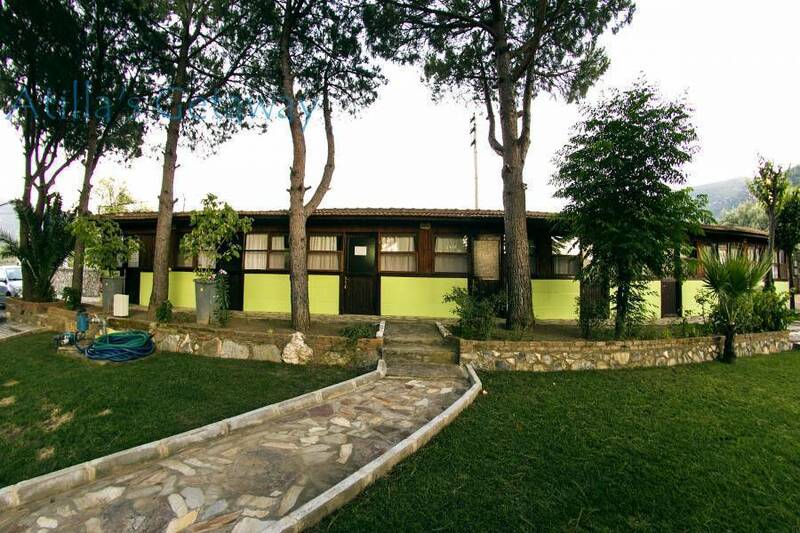 Our budget accommodation caters to everyone with private and shared facilities, bungalows, doubles, twins and single rooms, as well as cosy dorm rooms and camping. Along with the superstar personalities of our staff, Atillas Getaway is run by a laid back friendly Aussie-Turkish family. With great vibes, food and hospitality, youll be able to chill out and relax by our spring water swimming pool or in one of our chill out areas. We also have volleyball, pool, table tennis, backgammon and other games, which are provided free of charge. If youve been on the road for a while, why not put your feet up and indulge in a Thai massage by our qualified Thai masseuse, who also specialises in manicure and pedicures. After this, take a dip and soak up the sun! Desperate for a decent feed? Suffer no more with our delicious home-cooked traditional Turkish food, as well as other European dishes which are provided for breakfast, lunch and dinner. All meals are 100% organic and prepared on-site. Our homemade yoghurt, milk and oven-baked bread is supplied from the traditional Turkish village of Acarlar. We have our own vegetable patch and numerous fruit trees around the garden free for you to pick. Special dietary needs can also be catered for on request. Need help with your travel plans? At Atillas Getaway, our wealth and knowledge is paramount to travellers and thats what makes us one of the best places to stay in Turkey! We provide a range of flexible services in an informal environment. Our staff are well travelled and their knowledge is second to none! Our onsite Travel Shop can help you with any enquiry, whether its booking flight tickets, buses or ferries to Greece, as well as any tours or activities you may wish to do. 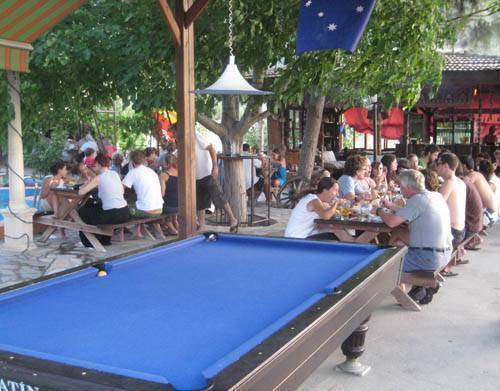 Our facilities include a spring water swimming pool, poolside bar, chill-out areas, a pool table, volleyball court, table tennis, darts & board games, a gym, Nargile (Turkish smoking pipe), luggage storage, a safety deposit box and parking. Our services include a free shuttle bus, internet & CD-burning, phone & fax access, a travel shop, book exchange, Fox Sports on the big screen, laundry service, Thai massage and manicure & pedicure. Our budget accommodation caters to everyone with private and shared facilities, bungalows, doubles, twins and single rooms, as well as cosy dorm rooms and camping. Our dorm rooms are equipped with their own ensuite. Each dorm contains 8 single beds (no bunk beds!). Our cosy bungalows with shared facilities come in double, twin, triple or quad and are situated in front of our spring water swimming pool. Our private rooms with ensuite all have the option of air-conditioning and come in single, twin, double and triple. Situated only 2. 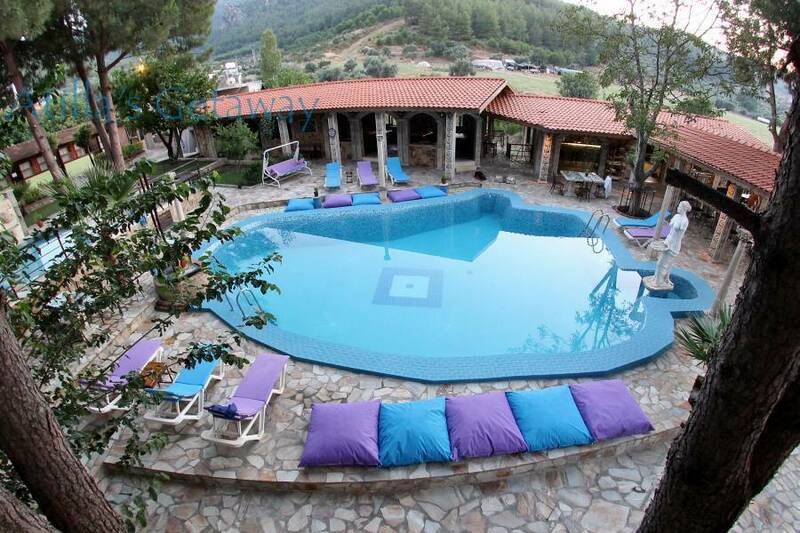 5 kilometres from Selçuk and 7 km away from the Aegean Sea & Europe's biggest water park, Atilla's Getaway offers easy access for day trips to Pamukkale, the Greek Island of Samos and other ancient sites such as Priene, Miletus and Didyma. We have a free shuttle bus to Selçuk that departs throughout the day, as well as free pick up from Kusadasi Ferry Port if youre arriving via the Greek Islands. Our pool-side bar provides a variety of delicious sandwiches, salad & hot chips. All meals are 100% organic & prepared on-site. Hans Restaurant is a buffet style restaurant with the choice of traditional Turkish hot and cold dishes. In the event of cancellation or no-shows, you will be charged 80% of the room price to your credit card. You may however, change your booking dates at any time, at no extra charge. Selçuk is a small town and has one main road with a small roundabout. Once on the roundabout, head south towards Aydin (the hospital and sign for Ephesus will be on your right) for about 2. 5 kms. We are located on the right hand side of the road behind Han Restaurant and just before the Diesel Outlet store. Can't miss us! WE provide FREE PICK UP from SELCUK BUS STATION. Once you arrive into Selçuk Bus Station, go to the Aydin Bus Company Office and they will contact us to pick you up. We will be there within 5 mins. 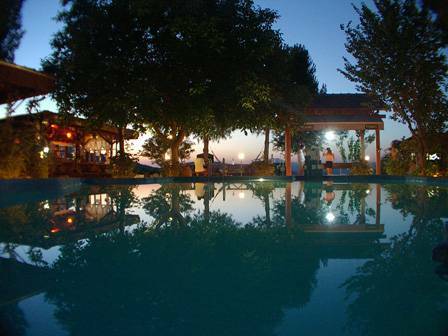 We provide a free shuttle bus service to and from Selcuk 5 times a day.